LEDGlow's Add-On Single Color Flexible Motorcycle LED Lights allows you to expand your single color flexible motorcycle LED lighting kit to add up to 12 strips for added illumination. 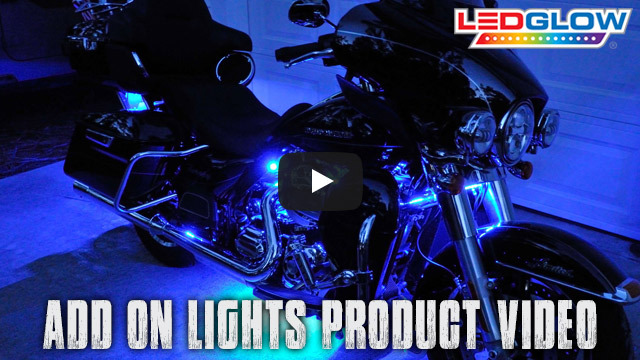 LEDGlow's Classic Single Color Motorcycle Lighting Add-On Kit allows you to easily connect additional strips to your existing single color flexible motorcycle LED kit. Each add on light strip pair comes included with an expansion power harness. 3M™ tape on the back of each strip as well as two zip ties are included with each kit to ensure easy fitting on your motorcycle. LEDGlow's LED lights for motorcycles include a one year limited warranty and free lifetime technical support. I installed the purple LED on my bike and have had a lot of compliments. Friends want them for their bikes now. I am buying a set for my brothers bike for his birthday. You won't be disappointed with these lights. I am now looking to add another 2 lights to my bike as well. I have a cruiser and would recommend the 10 pcs. I originally bought the 8 pcs but want 2 more to install under the front fender to shine down on the front wheel. The wires are small and can be easily hidden. I like that fact because I like clean looks. You can also hide the lights so they only shine down on the chrome and bike itself, gives a great look. Go ahead and buy them, you will love them and so will your friends. I put the green one on my harley duce and they look great. Thanks again to ledglow for a great light system and realey great servive. The shipping was fast to. So dont wait if you want great lights for your bike, order now.